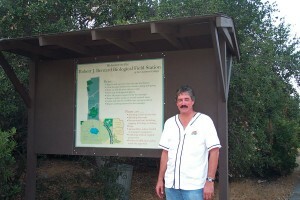 BFS Director Gene Fowler with the newly created sign for the BFS entry, 30 September 2001. ©Nancy Hamlett. It is with great sadness that the BFS notes the passing of former BFS Director, Dr. Gene Fowler. Dr. Fowler died November 1, 2012, at Pomona Valley Hospital Medical Center following a serious illness. Dr. Fowler was Associate Professor of Biology at Pomona College and served as Co-Director or Director of the BFS from 1995–2001. He completed his undergraduate work at California State University, Sacramento, receiving a B.S. with honors in Biological Conservation, and he subsequently received an M.S. in Wildland Resource Science from UC Berkeley and a Ph.D. in Zoology from the University of Washington before coming to Pomona in 1993. At Pomona he taught courses in biology and Environmental Analysis, including Conservation Biology, Comparative Endocrinology, and Introduction to Environmental Studies. He was also instrumental in the founding of the Environmental Analysis program and for many years served as faculty advisor for students in the EA environmental biology track. Dr. Fowler was a staunch supporter and advocate of the field station, and, in addition to serving as Director, he carried out research at the field station, supervising a number of student theses carried out at the BFS. He is survived by his wife Cynthia Peters and son Zachary; his parents, Murray and Audrey Fowler; and siblings Alan Fowler, Linda Allen, Tricia Craft and Janet Akema, and their families. There will be a “celebration of life” for Dr. Fowler and the people whose lives he touched on Saturday, November 24, 2012, at 2 p.m., in Little Bridges (Bridges Hall of Music, Pomona College, 150 E. Fourth St., Claremont), with a reception following. In lieu of flowers, the family is asking that donations in Gene’s memory go to either the Claremont Educational Foundation or the California State Parks Foundation.